Continuously increasing the operational efficiency in shipping is a condition for staying in business. Increasing crew awareness and knowledge of accurate fuel consumption is key to getting the most out of improvement projects and new procedures. Data driven decision making in real-time is the cornerstone of securing the added profit when optimising the operation. Performance monitoring systems will be an integrated part of (most) ship systems within the foreseeable future, because the decision-making process is made easier and more tangible when based on real-time ship data, as opposed to manually gathered data (noon-reports) and hard-to-transfer experiences of chiefs on board. Because no performance system is better than the data it is based on, our system uses data gathered from different consumers. The system provides a valuable and efficient monitoring tool for crew on board and shore. It provides the operator with real-time indications of the vessel’s immediate fuel efficiency and consumption in an environment with ever-changing dynamics. As the crew start to understand how internal and external factors affect the vessel’s fuel consumption the most cost-effective optimisation projects can be implemented and your competitive advantage maximized. The crew has a tool to accomplish their primary task; to optimize the efficiency of the ship and thereby the added profit. The crew now have the necessary information to take action, when sailing conditions or routes change. The Performance Monitoring System is a further development of the Fuel Consumption System, which mainly consists of flow meter data. The additional data input for the performance system are: Torque, speed and power from generators. Furthermore the system is able to draw and log existing NMEA signals, e.g. GPS, anemometer, gyro and echo sounder. Under the proposed amendments to MARPOL Annex VI, Regulation 22, all ships must have an International Energy Efficiency Certificate (IEEC), which requires the presence of a Ship Energy Efficiency Management Plan (SEEMP) on board. The SEEMP is a ship specific plan developed by the ship owner, operator or charterer; the objective is to improve the energy efficiency of a ship’s operation. Using our Performance Monitoring System you can continuously log performance data, establish a valid baseline and have an easy-to-use management tool that minimizes the administrative burden on board related to the SEEMP. The system helps you evaluate vessels’ performance as well as providing you with input to setting new SEEMP goals. This enables you to track the benefits of each of your initiatives. Contact our expert for more information about utilization, customization, implementation and price. 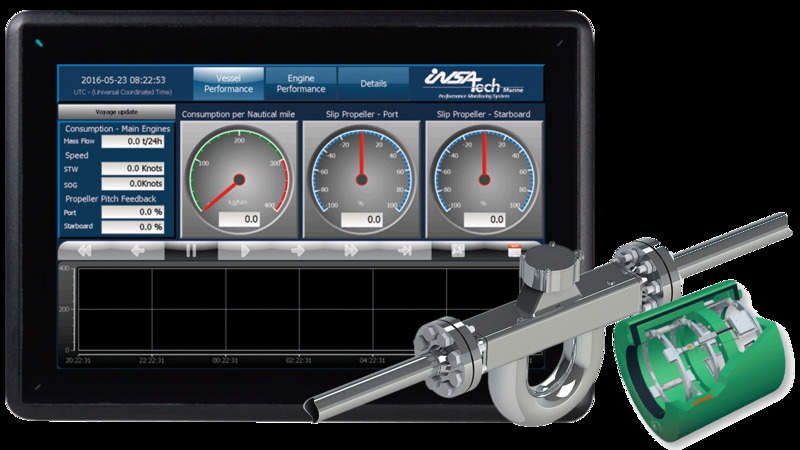 The Performance Monitoring System allows deep insight into your vessel’s performance. Use it to increase crew awareness, reduce consumption, trending, maintenance and planning. It works by gathering consumer signals and displaying real-time data on the bridge, in the engine control room or headquarters, for your organisation’s benefit. By installing one or more mass flow meters, depending on engine supply line layout and desired insight, fuel consumption can be monitored closely in real-time. The main principle is to measure the flow of fuel before and after the engine and/or generators. When you combine the consumption data with measurements of actual speed and position (based on speed log and GPS signals) you are able to directly measure the fuel efficiency. If you require more detailed readings, additional flow meters can be installed. Combine our system with on board data from a propeller shaft torque meter, speed log, anemometer, gyro, motion sensor and power meters on generators, and get for instance KPI’s (Key Performance Indicators) for engine and hull performance calculated and visualized. The measurements from the Performance Monitoring System will be sent through Modbus signals to a collecting and processing cabinet, where the performance data will be calculated, logged and displayed on a touch screen. Getting the data to headquarters requires the data link option. It consists of two databases: One on board the ship and one at headquarters. Data will be sent at the frequency chosen between the two databases. If the ship does not have an internet connection for a time, data will merely be stored and sent home once the connection is re-established. And most importantly let the crew get data insight to increase crew awareness as well as improving knowledge of operational performance. The Performance Monitoring System is fully automated and requires little attention after initial set up. The operator panel displaying the measured data can be customized to show your desired data. Spending less time operating equipment or reading manuals, means more time for improving the current operational status of the vessel. Therefore the Performance Monitoring System draws all the signals from instruments to a central processing station, the control cabinet. Here the data is used to calculate the vessel’s real-time performance. This is presented as KPI’s such as Specific Fuel Oil Consumption (SFOC) and kg of fuel per nautical mile (kg/Nm). There are several advantages to real-time data and KPI’s as opposed to noon reports and manual readings. The KPI’s give the crew an insight into the ship’s performance that can help them sail the vessel more efficiently. This will in turn make your fleet more competitive, helping you win orders and save money. The automation of data collection will ensure that you get better data quality as well as quantity. Instead of data once a day you will get data once a minute. This data can help you gain insight into how the vessel is being sailed right now, as well as being used to educate the crew on how to sail more efficiently. The automation will also free up crew time for other more important tasks. With the motion sensor installed it is possible to determine the influences of weather on the ship. This is done by determining the state of the weather (wind and waves) for a limited period of time after the installation and manually inputting it into the system. Afterwards it will be possible to use the gathered data to calculate the ship’s performance under different weather conditions. When the crew has the information available at all times, it allows them to view the immediate consequences of any actions taken and how it affects the vessel’s overall performance. Using the KPI’s as main indicators of the vessel’s performance means that any change in conditions or operation affecting performance, will result in KPI changes. As all readings are available centrally, running conditions of monitored vessel components can be checked right away. Troubleshooting as well as corrective and optimising actions can be identified a lot easier compared to manual visual inspections, and potentially lead to savings in fuel and crew resources. The operator interface is designed to be easy to use. The main screen will immediately show the relevant information regarding current vessel performance such as consumption of the main engine, consumption per nautical mile, propeller slip etc. The user will also be able to see the development over time via the chart. The Engine performance screen shows information about the specific fuel oil consumption of the main engines as well as shaft power in kW and %. The data is logged and shown in the chart below in order to give a historical insight into the engine performance. In Details you can see an overview of the torque meter data such as power in kW, total power in MWh, RPM, total revolutions as well as torque in kNm. All the data are plotted on a chart in order to show the development over time. In Details you will also find the Detailed fuel overview which shows the daily, actual and total consumption of each consumer, for example Main Engine(s), Auxiliary Engines and Boilers. Furthermore the view also shows the raw values from the flow meters such as mass flow, volume flow, density and temperature for both inlet and outlet. The navigational data includes GPS coordinates, true course and speed, wind direction and wind speed, true heading and rate of turn, under keel clearance, rudder position and movement as well as draft signals. The Service parameters displays raw data for each flow meter related to consumers. It shows the main menu data and provides the possibility for a manual totalizer. From here the alarm status screens are set up. The simplest way of measuring fuel consumption is by installing a single flow meter, which measures the fuel transferred from the fuel tank to the settling tank. The level of fuel in the settling tank is typically maintained by level sensors, and therefore the flow to the settling tank is equal to what is consumed. If more detailed monitoring is desired, then a 3-meter setup can be introduced. With the 3-meter system, the total fuel consumption is monitored by flow from fuel tank to settling tank. A set of flow meters, installed on the common auxiliary fuel supply line and return line, will provide the total consumption measurement of the auxiliary engines. By subtraction, the main engine fuel consumption can be calculated. By splitting the main engine and the auxiliary engines, the crew on board as well as on shore has a much more detailed overview of how the consumers perform. To gain full understanding of the fuel consumption, you measure on each consumer inlet and outlet. This will provide a complete insight into each consumer’s fuel consumption, and any deviations from performance expectations or norms, can easily be pinpointed. This can potentially aid in preventative maintenance planning and better utilisation of auxiliary engines. Insatech Marine is not restricted regarding installations. Therefore if you have your own specific setup that you would prefer, we can accommodate a corresponding setup or install the system on existing flow meters. In such cases we will typically include an engine pre-inspection to ensure technical feasibility of the setup. The system installation does not generate unnecessary costs, it will not alter your schedule or put your vessel out of service. Our experienced technicians install and commission the system while your vessel is in service, whether at sea, in port or dry dock. We are ready to move out at your preferred destination and time. The system is programmed, calibrated and has been initially setup by our technicians to minimize installation time onboard. The crew on board will in some cases be able to install the equipment under the guidance of Insatech Marine’s technicians, to ensure correct placement and electrical installation. This minimizes cost and required man-hours, while ensuring maximum benefit of the system during use. However, we are also able to provide installation with commissioning, tests and training of the crew. We can complete the installation at sea, in port or dry dock at your preference. at sea, in port or dry dock at your preference. If you require a service agreement as part of the system our skilled technicians are ready to service your vessel at all times. While the system requires minimal maintenance an occasional calibration of equipment is recommended. To constantly get highly accurate measurements, your marine equipment must function optimally. This means it must be calibrated according to the purpose, and therefore we provide service options, should the need arise. This is why we have our own technicians ready for service on board your vessel at all times, whether it is a planned service visit or a pressing and acute matter that needs immediate attention. As the equipment used for the Bunker Management System is mostly constituted by components without moving parts, the need for active maintenance is minimal. Nonetheless there might be equipment in need of calibration or service from time to time, and depending on the specific setup, a service and maintenance plan will be issued with each individual Bunker Management System. 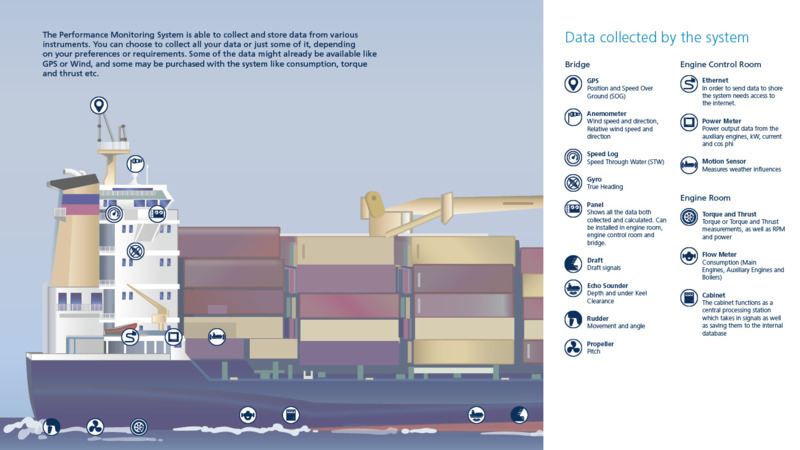 Use ship data for enhanced decision-making and cost reductions on ship and shore. For one vessel or the entire fleet. Team Tankers International has embarked on a data driven journey, which is already helping them optimise performance and cooperation between ship and shore. Tanker Operator: Insatech "Measuring up to Performance"
In the March edition of Tanker Operator Henrik Nielsen, Sales Manager Marine, explains the benefits of our performance monitoring system. Chief Financial Officer from Ecoships talks about the current opportunity for shipowners to reinvest in technologies leveraging efficient ship operations with the money saved from low bunker prices.